K and I got sucked in to watching BBC’s Great British Menu (GBM) for the first time this year; already in its 12th series. 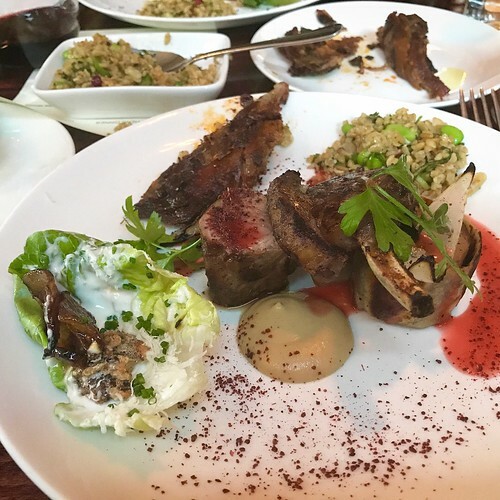 We were supporting Selin Kiazim (“lovely hair”) Chef of Oklava, partly because we’re Londoners and partly because her chargrilled “modern Turkish” food looks so mouth-wateringly good. Oklava was first recommended to me well over a year ago and has been on the LardButty hitlist ever since. 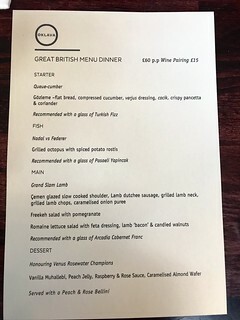 So when I saw this tweet announcing a special GBM Wimbledon dinner serving all four courses @ £60.00, it was time to act. Quickly. Booking made. But not for long. Nom nom. 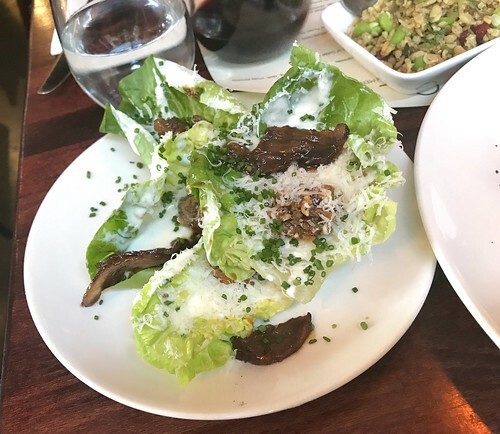 Being located on a street corner with two walls of windows, it feels light and airy inside Oklava even though it’s a fairly small restaurant (about 50 covers). The kitchen is open-plan, with high stool seating at the counter so you can watch food being prepared and cooked in the stone oven or on the charcoal grill (mangal). 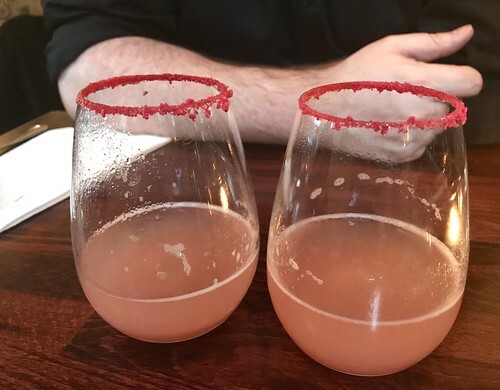 On arrival, we were seated at a regular table by an open window – ideal for a warm summer evening. And service was really good – nicely casual, professional, and chatty too. First decision: we opted for the wine pairings with this special dinner, which meant we got to try three types of Turkish wine. K hates cucumber. He won’t eat it, he won’t go near it. 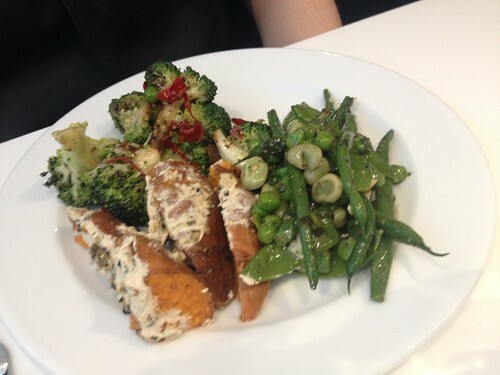 He absolutely loved this dish – I think that says it all really. The flavours of all the ingredients combined together was sensational. I dislike fresh coriander but ate and enjoyed it here, and the salty crispy pancetta finished it off royally. Yum. 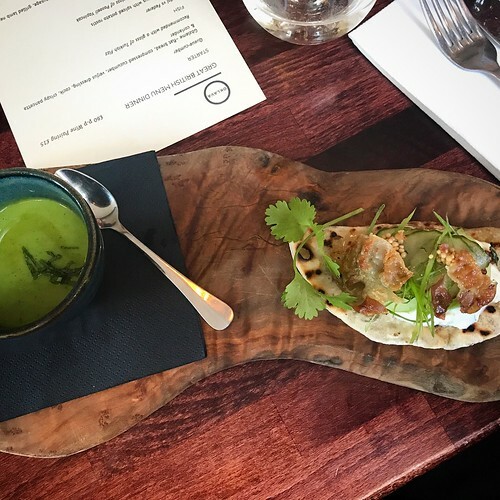 Another treat to the tastebuds – the octopus didn’t quite live up to my expectations (I’d drooled watching the octopus being grilled on TV) but the rostis were crispy and just gorgeous. 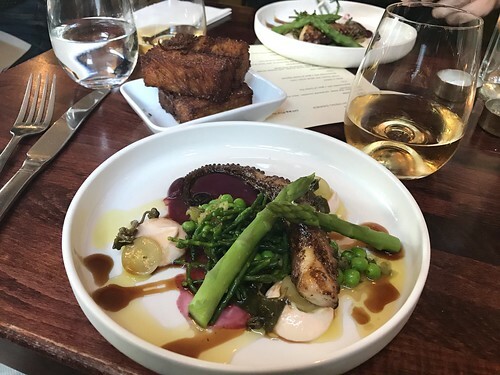 The Pasaeli Yapincak wine pairing was interesting too – a chilled white wine with a slightly musty taste when drunk on its own, but it sprang to life with this dish and went perfectly. On to the highlight of this Wimbledon themed dinner: the Grand Slam Lamb main course, which really stood out. How it didn’t win the main course round on GBM is beyond my understanding. Four types of lamb, all so different and all so, so special. 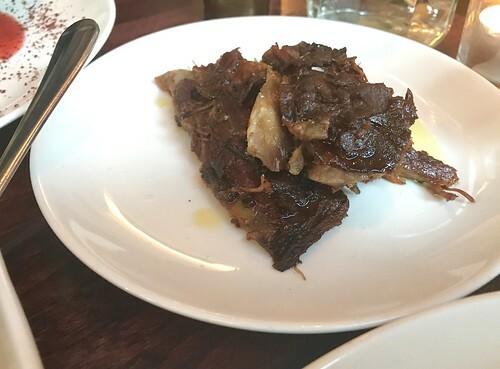 The çemen glazed slow cooked lamb shoulder had dense, rich, smoky flavours (so strong I wouldn’t be able to eat a lot of it so… perfect in a meat selection) and the dutchee sausage with all its spices was something else. Unfortunately the onion purée didn’t like me (but we don’t need to talk about that here…). 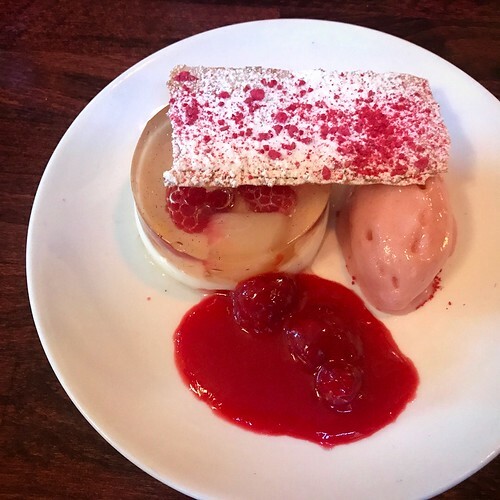 Next up: peach and rose bellini, with dessert – vanilla muhallebi (Turkish panna cotta) with peach jelly, raspberry and rosewater sauce, and a caramelised almond wafer. The verdict: Great service from both of our servers. Staff looked as though they were all enjoying themselves working here, and working together as a team, which was nice (that’s not something that comes across very often in restaurants and was noticeable because of it). The interior’s really pleasing (patterned shadows from lamp shades cast on walls, light and airy with open windows) and the food we had for this GBM dinner was an absolute treat. Having enjoyed the lamb selection so much, I’m keen to return to try the Sunday Feast. We’re back ordering take-aways through Just Eat after a few weeks trying out Deliveroo (unsuccessfully). 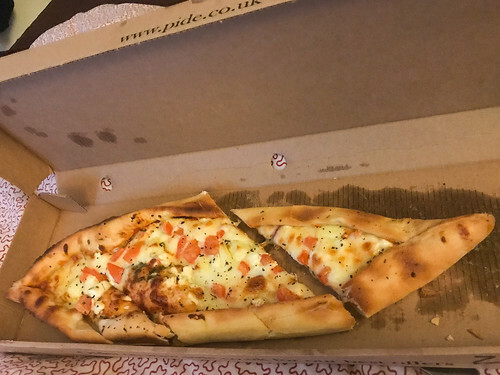 Last night we ordered a delivery from old favourite, Pide the grandfather of pizza, through Just Eat. 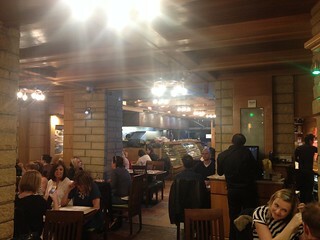 Easy to order, the Turkish pizzas and salad arrived promptly within the hour. 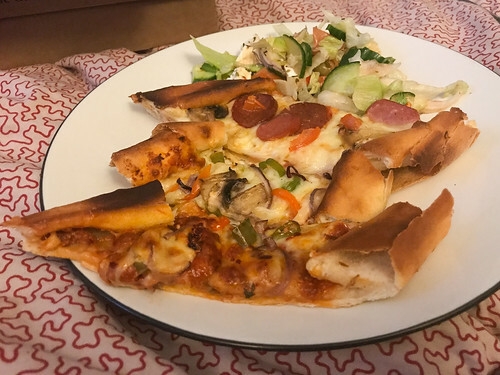 The order was correct; pizza was fresh and hot, salad chilled, and all very tasty. 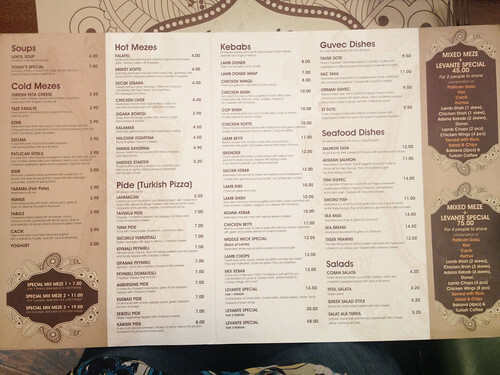 Catford’s newest Turkish restaurant is up against some tough – and established – competition (with the likes of Turkish Kitchen, Mekan and Turquaz). How would AyaSofya compare? K and I visited spontaneously last night, to find out. At 6pm the restaurant was empty. We were greeted promptly and quickly shown to a table. While the white wines didn’t appeal (limited choice including some Turkish wines that we weren’t familiar with and chose not to be adventurous) we ordered a bottle of Rioja, Spanish red @ £16.95. It wasn’t in stock so we settled for a Merlot wine from the Bordeaux region instead. 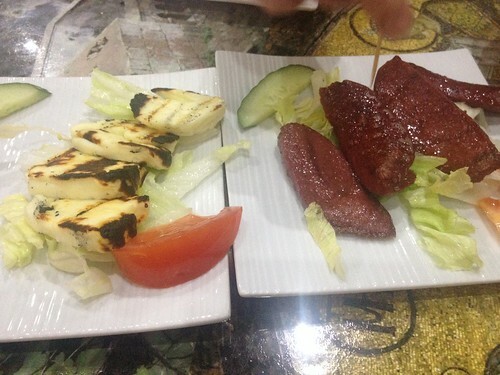 For starters we shared sucuk (spicy Turkish sausage – gorgeous) @ £3.50, deep fried calamari @ £3.95 (light and tender, served piping hot) and grilled hellim cheese @ £3.95. 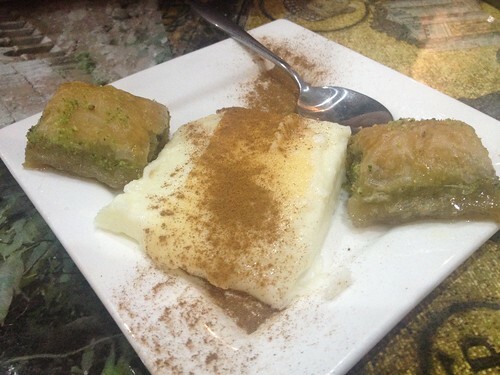 Our server was attentive and helpful, and made recommendations about the dishes when asked. 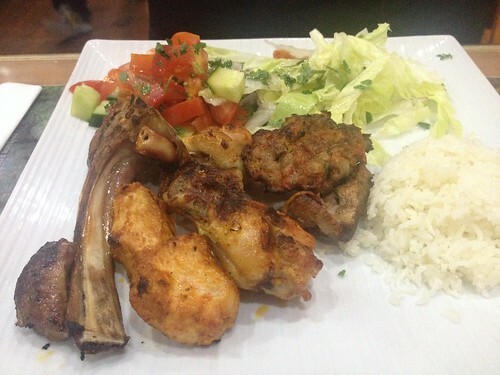 For mains, K ordered a karisik kebab – chicken and lamb on the bone with side salad and rice @ £12.95 (excellent) and I ordered the AyaSofya special – chicken and lamb cubes in tomato with yoghurt, served with a side salad and rice, and chilli sauce @ £12.95 (this was great – the meat was lovely and tender, and really filling too). A group of ladies came into the restaurant to prepare it for a 60th birthday party, hanging lots of personal photos and ’60th’ decorations, obviously enjoying themselves and adding to a chirpy atmosphere. The verdict: Nice, comfortable space where it’s easy to relax and enjoy the friendly service and great food. 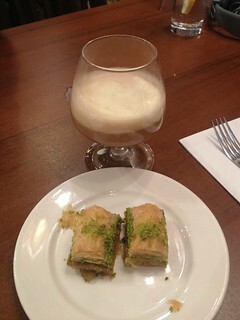 I’ll save room to order a dessert next time, as the Turkish milk pudding is divine. Great value too – our total bill for two including service came to £60.00). Walking along Artillery Lane, Spitalfields the other lunchtime, C and I spotted a newly opened branch of Ottolenghi (serving Mediterranean food and with an appealing cake display). We decided spontaneously to eat there. Here’s the lunch menu from that particular day. We both ordered a lunchtime small salad (selection of three salads) @ £11.50. To drink, I had a small Spanish Sameiras Blanco (an excellent dry white wine that went well with the salad flavours) and C had a Cheverny rosé wine (@ £6.50 each). The wine selection was unusual and we were both pleased with our choices. I bought two lemon and mascarpone tarts @ £3.50 each to take home (intended to be a treat for K). Unfortunately, when we bit into them that evening, K’s face immediately creased up and he spat his mouthful out. The pastry was just vile (it had an unpleasant lard flavour to it, as if it had soaked up the flavour of something it shouldn’t have). One seriously disappointed K! While this may have been unlucky and a one-off accident, I won’t be buying any cakes from Ottolenghi for a long while, if ever again. The verdict: Great salads and wines, shame about the cake. We decided to end the working week relaxing over a meal out on Friday evening. We wanted somewhere nice. And somewhere in Lewisham, South East London. 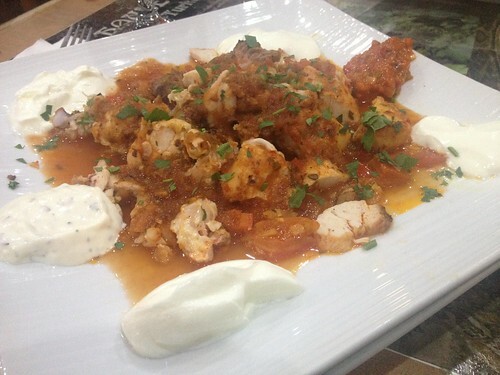 A web search (Google, Open Table, Trip Advisor, etc) showed that Levante Pide, a Turkish restaurant on Lewisham High Street, had better reviews and ranking over other central Lewisham restaurants. And so I booked a table via the Open Table site. Roll on 8pm Friday night: on arrival the restaurant was packed and we were told they didn’t have our booking – perhaps we’d booked the restaurant with a similar name (Levante) at Hither Green? I showed the booking on my phone and we were shown to a table for two. Mix-up cleared. 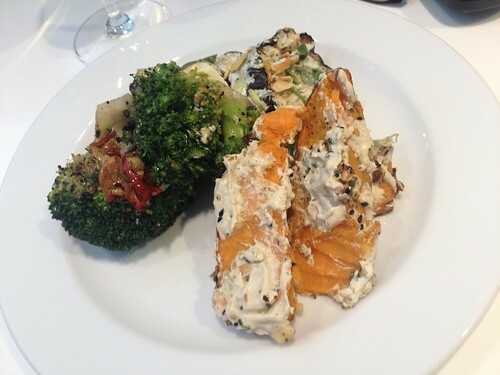 We weren’t in any hurry – we were intent on having a relaxing, leisurely meal. Even so, service was incredibly slow (to the extent I had to go find our waiter at one point). We ordered a bottle of chianti red wine, reasonably priced at £19.00 and these mixed meze starters: grilled haloumi cheese @ £4.50, sucuk izgara spicy Turkish sausage (excellent) @ £4.50, sigara boregi deep-fried filo dough stuffed with creamy Turkish white cheese and parsley @ £3.90 and calamari fried squid in a light crispy batter @ £4.50. They were all good and served with fresh salad but the sausage stood out as being the speciality dish here. For main course, K ordered Iskender kebab – lamb doner served with butter-coated bread with yoghurt and special Anatolian sauce, topped with sizzling butter @ £12.00 (simply amazing – really tender lamb pieces and gorgeous spicy sauce and flavours) and I had an Adana kebab – minced meat marinated with herb and grilled @£10.00. This was tainted with an unpleasant gassy flavour (from the way it had been grilled?) and I left it. While I’m not the world’s biggest fan of puddings, I do love baklava (honey and nuts – my kind of ingredients) so in the interest of benchmarking (ahem) we ordered a portion to share (this was tasty enough but @ £3.50 for two pieces it seemed either over-priced or a small portion) along with an Irish coffee made with Baileys @ £3.90 each. The verdict: a bit hit and miss (some food was great, some food – like the complimentary bread and the Adana kebab – had an unpleasant gassy taste) and service was poor. There are plenty of other good Turkish restaurants in the area, like Turquaz (with friendly staff and entertaining belly dancing) that have an edge over Levante Pide. 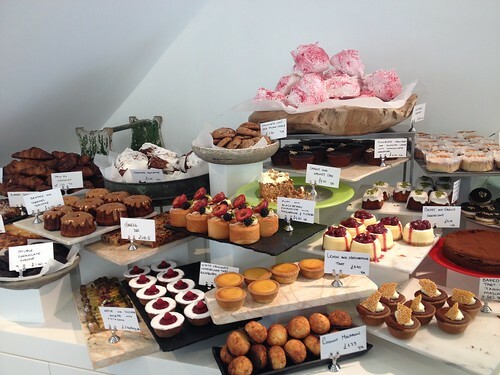 And – if your dining criteria is a good restaurant in the Lewisham area – head over to Catford, where there are several great restaurants and a variety of international cuisines. 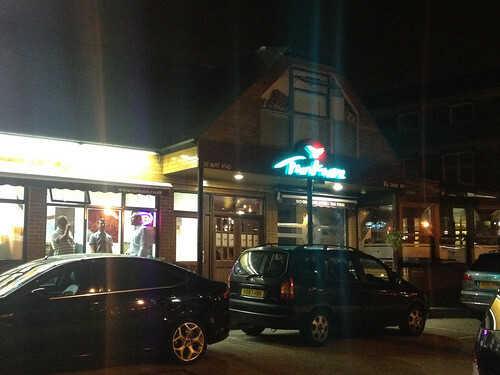 Next door to the large TFC Turkish supermarket on busy Bromley Road, you’ll find Turquaz Turkish restaurant. We’d walked passed it many times and not thought much of it (it’s not especially appealing from outside). It was some enthusiastic personal recommendations that led us here last night. 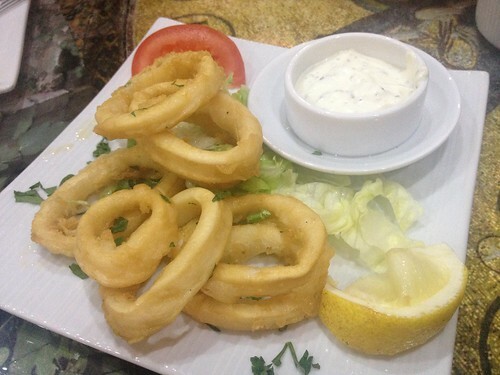 What sets it apart is its super-welcoming, friendly staff (who genuinely seem to enjoy themselves looking after their customers), great Turkish food and lively atmosphere with live belly-dancing entertainment by a stunning dancer. 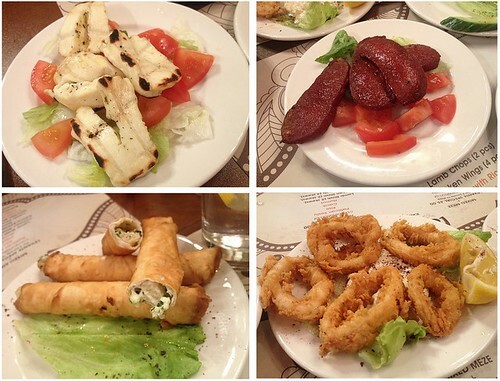 For starters we shared a mixed hot meze @ £9.90 – borek (cheese-filled pastries – outstanding), hellim (grilled halloumi), sucuk (spicy Turkish sausage) and calamari (tender squid in light, crisp batter). 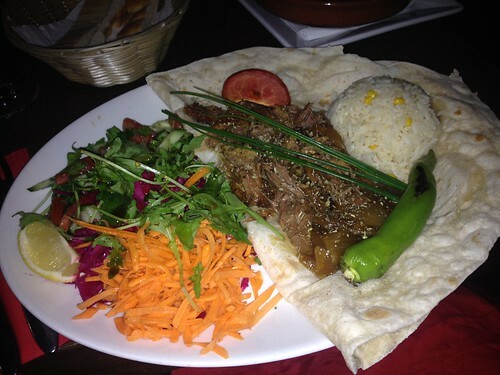 For main course, I had a tandir @ £13.95 – an Anatolian speciality of very slow oven-baked lamb, served on fresh, paper-thin flat bread with rice and salad. 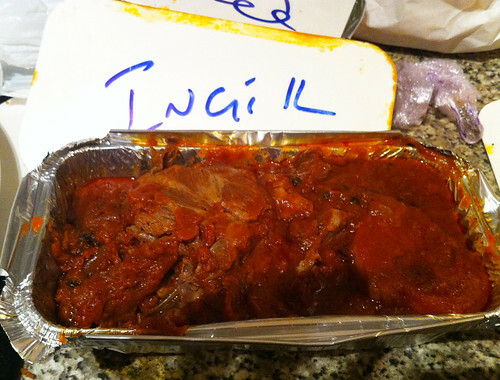 This really was special – the bread was really light and the lamb just melted in my mouth. 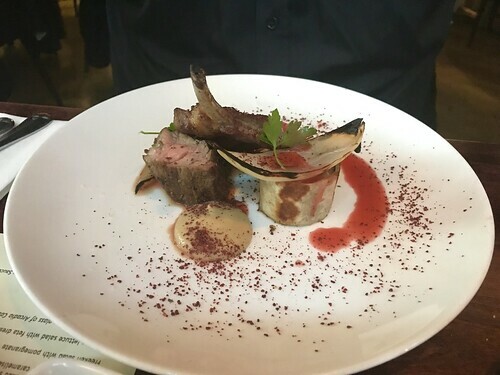 It’ll be a challenge for me to try something different on Turquaz’s menu next time, having been thoroughly spoilt by this divine lamb dish. K had lamb guvec @ £11.95 – a traditional Turkish casserole with onions, peppers, aubergines, mushrooms, tomatoes and a blend of spices with lamb cooked in a clay pot (disappointingly bland; not in the same league as the tandir). Along with a bottle of unoaked Chardonnay dry white wine @ £16.50 (the wine selection was limited) and a bottle of Efes beer @ £4.50, our total bill for two came to £55.80, excluding service – very good value. The verdict: Generous food portions, fab staff and great food. The belly dancer was a really good dancer and got the odd customer up to dance and even the waiters too. This light-hearted entertainment is what makes Turquaz a bit different, although K felt it was bordering on the atmosphere of a package holiday hotel with in-house entertainment. We don’t eat a lot of take-aways (honest) but this week we’ve had two. Both Turkish. Both ordered through Just Eat. And both possibly from the same people as it turns out (I only happened to notice that Pide and Turkish Kitchen have next-door addresses when writing this blog post). 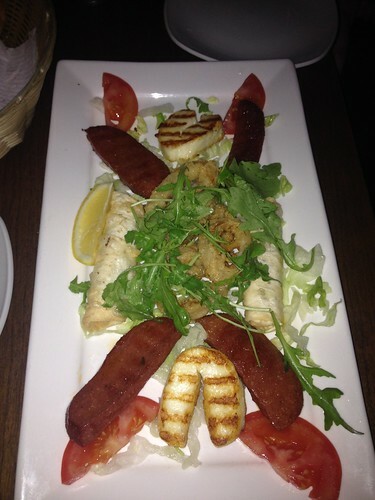 So, it’s a Tuesday night and we fancy some Turkish meze type sharing food. 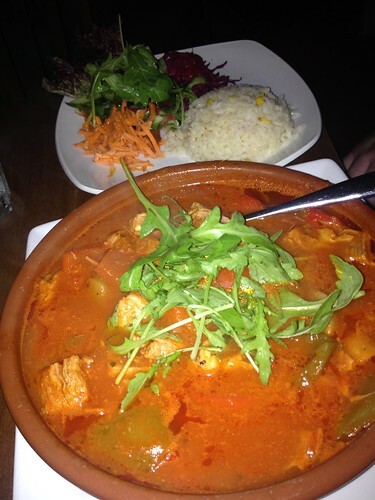 Turkish Kitchen fits the bill. 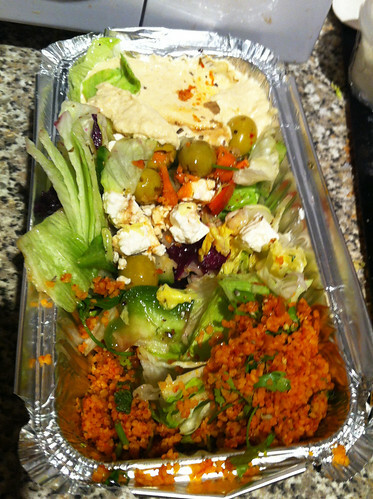 The Turkish mixed salad contained a variety of ingredients, including a mix of leaves, hummus, olives, and cous cous. And lovely and fresh. All good quality, tasty fresh food and reasonably priced.